I arrived in Donetsk four years ago today, December 7th, 2014. A week later I enlisted in the Essence of Time combat unit of VOSTOK Battalion. I served as a rifleman, anti-sniper and RPG gunner at front line positions, punishing the "Punishers". Then we were rotated back from the Front at the end of June 2015 when the EoT unit became attached to XAH Battalion Spetsnaz. Two months later, at the end of August 2015, I began working full time as a war correspondent and human aid worker. I am still in the Novorussian Army reserves, and continue to write, make videos, do interviews and human aid work. At the age of 58, I can look back on the last 4 years and honestly say they have been the best years of my life. These years have been good, but they have not been easy. I served at front line positions at Donetsk Airport, Spartak, and Avdeevka during the days of the heaviest fighting. The conditions were brutal, and the firefights were almost daily. The XAH Battalion was just as tough as being at the Front. XAH is probably the toughest unit in the whole NAF, and the lifestyle on base reflects that. My time since retiring from military service has also been marked by extremely hard work and difficult situations, dealt with on a daily basis. My wife and I work 12 to 14 hour days, every day. We do not take vacations, and if on a rare day we only work 8 hours or so, we consider it a day off. We don't get many days off. I have traveled to Crimea twice, Moscow and Grozny once each, and to Rostov many times. Each of these trips was for work, none was anywhere near a vacation. Other than that, for the last four years, I have been in Donbass. I came here to fight Fascists and to help the regular people of Donbass, and that is what I have done and will keep doing. Maybe we will all take a vacation when the war is over. Until then, the job continues, every day. Since I left the Army in 2015, I have not been paid by anyone for my work, other than by friends and supporters who contribute to help keep me alive and continuing to work. They have my most heartfelt thanks and respect. They are an essential part of the work that all of us together have done here. I have learned a lot in these last 4 years, about Russian history and culture, what it means to have a "Russian Soul". (I do not say I have one, my friends say I do.) I have learned that even in the fight against genuine Fascism, there are good and bad people on both sides, that not everyone who professes to be against the Kiev Regime is necessarily on my side, or on the side of the People of the DPR. Some so-called "comrades" have tried as hard to put knives in my back as the ukrop soldiers have tried to put bullets in my face. I have deal with them as I see fit, based on what I see as being best for the Republic I came here to help and to defend, confident that all treachery will eventually be known and that those who try to set traps will eventually fall into them themselves. I did not come here to make a career or a name for myself, or to make money. I came here to stand beside the people and the defenders of Donbass, and to live or die with them, come what may. I did not expect to live through that first Winter four years ago, but I came anyway, and I survived. I was lucky. Too many of those I stood with at the Front were not. Too many. I stand by everything I have done here, every act, every word spoken or written. I am not perfect, not a genius or a saint, I have made mistakes. But I made them in good faith, working hard for a good cause. I did not try to hide them. And those who have done more than I, with less mistakes, are qualified to criticize my work. Those who have not should keep silence, and take a lesson from it. My work speaks for itself. Doing good, helping those in need, fighting against monsters, speaking truth to power on both sides, these acts are their own rewards. It has not been easy, but it has been worth it. Besides, as the saying goes, "If it was easy, everybody would be doing it." Life is good here, and getting better daily, but it is not perfect. Just like me, the DPR has its problems, and the future is by no means sure, but this is my home, the best place I have ever lived, and I intend to live here for the rest of my life, however long that may be. And I intend to do everything I can to make it as best as possible, for the greatest number of citizens here, my family. The Donbass Republics have set an example for the world. We have fought the ukrop and western nazis to a standstill, and our continued existence is the proof of our victory. I am more proud of what we have done here, what I have contributed to, than any other thing I have been a part of in my life. The two best examples set by the people of the DPR are courage and solidarity. They first understand that courage is the key to happiness - it is impossible to be happy if you are afraid. We are not afraid. By contrast, the people of the USA are consumed by fear of everything, but especially of each other. The people of Donbass know that to accept oppression and injustice is to invite further outrages by their enemies against them. So we do not accept them. We understand that there are things greater than ourselves, things worth giving our lives to and for, and that if there are things worth dying for, there are things worth fighting for. Solidarity is another hallmark of the Donbass people. We look out for each other, and are well known for our generosity and hospitality. Along with the courage of our men and the beauty of our women, solidarity, generosity and hospitality are our defining characteristics. We are, by and large, proletarians, hard-working and wise. During the Soviet period, the people of Donbass were known as the most staunchly Communist people in the entire USSR. We do not just talk about their ideals, we live them. I am proud to be one of them. I have found my home, my happiness, my place in life, my destiny. I hope you find yours. Because we are all in this together, we will all share our destiny together, in the Whole, or in the Hole. Davai! DECEMBER FUND RAISER - HELP NEEDED NOW! This may be the most important fund-raiser we have ever done. It has the potential to generate ongoing and major funding for our human aid and journalism projects here in Donbass. Our December fund-raising project, of vital importance is to raise funds to print my book, The Donbass Cowboy, on paper (printed here in Donetsk) both in English and in Russian. The English e-book edition has sold multi-hundreds of copies, and raised over $5,000 for Donbass Human Aid projects. That's not bad, especially for a first-time author who is not using Amazon or other conventional sales outlets. The book has had very positive reviews for being well-written, honest, informative, unique and exciting. It's a good book! (If you haven't gotten your copy yet, you can. The potential market for this book in Russia is HUGE. Russians love books and reading, and they really like a good war story. I have had offers of support for the publication of the book from major players in the Russian media, publishing and otherwise. The translation of the book into Russian is near completion, and should be done by the end of the year. Then, we need editing, formatting, artwork and printing. That's where you come in. That's what this super important fund-raiser is for. The Russian edition of the book has tremendous sales potential in Russia, and can generate funds for our human aid and other projects far above what the English e-book already has, in a continuous stream of funding that will not depend on contributions which can dry up or be blocked at any time. THIS FUND-RAISER IS TIME SENSITIVE. NOW IS THE TIME TO CONTRIBUTE. The de-funding and de-platforming of alternate news sources continues and is escalating. My fund raisers have been targeted before by major anti-Russian propagandists such as the BBC, with serious economic impact. Their efforts to undermine our freedom of speech and the funding of our human aid and journalism will continue and intensify. Now is the time to contribute. Tomorrow may be too late. If you can't afford a monetary contribution, you can at least help by sharing a link to this page as far as possible. Not everyone can contribute financially, but everybody can do something. Even if you can't afford to send a donation, you can still contribute by sharing this info. 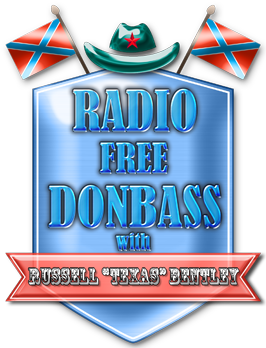 Donbass Human Aid through our Patreon or direct accounts. you can use a credit or debit card, and the contribution is tax deductible. DHA is a registered tax-exempt 501(c)3 charity. Without ALL the info above, I cannot pick up the money. I take a 12 hour round trip bus ride to Rostov to pick up Western Union funds, and if there is a problem I either have to go again or rent a hotel, so please make sure all info is sent and correct! Thanks to all who have contributed in the past. I ask you now to donate again for this vital project. If you have considered donating before but haven't yet, now is the time. Please don't put it off. Do it now, today. Time is of the essence. Tomorrow may be too late. It takes time to process the donations, get the funds and send them to Russia, and from there to Donetsk. So, now is the time to act. You can donate right now. You are online now, as you read this, and your credit card is right there in your purse or wallet. Go on, pull it out, make a donation for a good cause (or two!) part of your Christmas gift giving I promise, it's way better than going to the mall!